An American travel blogger and Guinness World Record holder, Drew Binsky has traveled to more than 100 countries since 2012. We previously talked about his recent North Korea vlog, that went viral on Facebook. On his site, he reveals that he decided to travel the world full-time after his experience living and working as an English teacher in Korea. 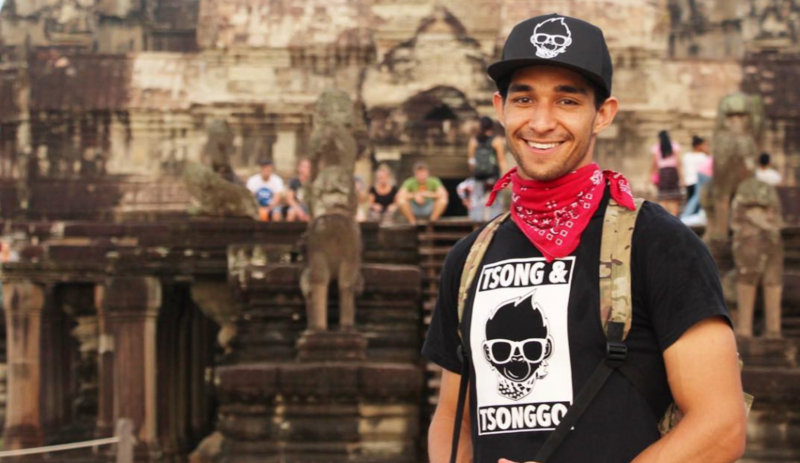 Wil Dasovich is a Filipino-American YouTuber and TV personality. Wil is known for his quirky style of filming and speaking Tagalog despite not being fluent. “Back in California, I grew up in a predominantly white community with no Filipinos around. But being half Filipino I became so intrigued with the language and culture,” he shares with Garage Magazine in an interview. The 25-year-old vlogger then made the decision to stay in the Philippines for at least a year, and challenged himself not leave the country until he was 100 % fluent in Tagalog. Stephen is an Australian vlogger who left everything behind to travel the world with his fiancée, Jess Valentine. The two run their site, www.flyingthenest.tv, together and share their adventures daily. Ahh, to be young and living the dream. Want a good laugh? Watch this couple have their wisdom teeth removed in this hilarious video. David Guison may still be new to the vlogging community, but this Filipino online influencer, with over 200,000 followers Instagram, has been putting out more video content recently. If you watch his YouTube videos (and Instagram Stories) enough, you’ll know that the lifestyle blogger is a total goofball, but also a stylish millennial. Damon Dominique is the other half of Damon And Jo, the adventurous duo behind the travel site and YouTube show called Shut Up and Go. If you’re young, living on a budget and would like to travel the world, this show is definitely for you. Damon, along with best friend Jo Franco, got tired of cheesy travel shows, so they decided to create their own (as mentioned in their Instagram bio). These ‘90s kids are changing the way we perceive travelers by showing in their videos that it’s possible to get around with a backpack, a few dollars and multiple languages under their belts. Who are your favorite travel vloggers? Share with us below!